The day after seeing a performance of 6½ Flying Circus' Canto – The Last Flying Chance in the North, I got to talk briefly with the show's director, Firenza Guidi, also widely known for her work with NoFit State Circus on their two last big touring shows, Immortal and tabú. I started off by asking how she thought yesterday's performance went. If I had to put my director's hat on I will have to say that the overall technical, um, let's say result was not satisfactory because that was what was happening. But if I put my sort of performance/creator hat on—where for me one of the fundamental givens is that you don't rehearse an action; what you rehearse is a state of mind that can cope with any unknown—a state of mind, a company that looks like they are not phased by anything, that looks like they are really listening to each other, that look like they're having fun even though things might be going all over the place—that is where I think, although it wasn't a perfect show, I think that the cast did really well on what we had been working on, and actually within that the tricks were very good, they were very high level. Sometimes we rehearsed much more during the day or the day before and the tricks were not as good. So overall it's still a research and development project that will become a product at a later stage. At this stage one of the best compliments that we got was in Helsinki—the guy that actually reviews circus all the time, the top circus guy, said 'I had a feeling, I had an experience, where I didn't know whether what was happening around me was planned or whether it just happened'. At the beginning I never know. When people say 'So where do your shows start?' there are always a series of strands, which in this case was getting the flying rig—you know, if we didn't have the flying rig there we could have speculated until we were in blue in the face but actually the hands-on thing wouldn't have come. The starting point of the work was actually OK guys we've now got this flying rig—what is it for you? Literally, go up, go down. Is it a house? Where is your kitchen? Where is your lounge? And actually this work—though not all of it is relevant—this work, what it produced was a sense of real ownership of the rig, where it's no longer 'this is the flying rig and what we do on the flying rig is this'. But actually you climb on it, you attach to it, you put suitcases on it—it becomes a whole place that is owned and, only a little bit later, for me it also became a place of memory. So we then started to work on little journeys of people within that; so I'm going up to the attic to get this suitcase and old coat and so on. One day I will write that long-due book that I'm planning, but actually to convey all the things that went into the creative process would not be for me a very exciting thing. The journey took us through explorations, discarding things, accepting other things, until we got to Helsinki, and where we were working in Helsinki it was a huge kind of postmodern industrial place were they used to fix trains. So it was like a warehouse, enormous, and actually the circus had the front part and you could see, in this long corridor in the very back, more and more of this world that would have belonged to an industrial—pre-industrial revolution. And from there I started thinking about—[laughing suddenly at the memory of her cruelty] I forced—ha!—I forced the cast to watch this film, Tuvalu, set in this dysfunctional swimming pool where this dysfunctional family live. They have no more clients in this swimming pool but there is this blind keeper who knows the functioning of the thermostat machine which is down in the dungeon—knows the whole thing—and visually it's fantastic: this place actually exists. And it's not that I wanted to create the swimming pool or that we were copying—it was a feel, a feel of these people, these few people remaining in this place, quite quirky people, who live their life knowing every inch of this place. And actually sometimes cleaning the rig or going down everybody's got their own way—Adie always goes down like a fireman and Marcella always goes down really awkwardly. Tan is little and so she's got to use her strength and she's created these little hoops—the three little hoops to get from one place to another. So that sense of... sense of a place that although it's shiny, steely poles it's actually warm, nostalgic, a place of memory, a place of identity and a crossroad of cultures. Tabú and Immortal are dinosaurs—you know, literally, to raise this... I mean I totally love this and I really enjoy a large scale, but it's obviously a different animal. Sometimes I go into the tent and go 'God it's so small in here' or 'Wow it's so big', and I know the tent very well. Immortal was a different show every year until it came to the last incarnation, which was inspired for me by the Roundhouse. We had to go with something like four days turnaround from the tent right into the Roundhouse, so I started from the Roundhouse and tried to bring the Roundhouse into the tent and vice versa. So the idea that I had there was to have a ring—what we ended up calling the doughnut—that would fit perfectly within the pillars of the Roundhouse and create a round, uninterrupted staging. Not too high because you end up in circus having a sore neck if you watch too much aerial work. Not too high and not too low, and that also created an inner corridor so that at the beginning you could see through the doughnut and actually see people walking and running over your head. I'm about to do a research and development in Liverpool next week which is called Firenza Guidi: Space as Collaborator, and I strongly still believe that no matter what it is—even if it's a well-known venue where people will assume that this is the bar, this is the theatre, this is the auditorium—I will always relook at it and listen to the place. I love the Roundhouse; people were saying you could never do anything like Immortal there. I did think that with tabú in the Roundhouse we did have problems, because we didn't have the doughnut and so to have the king poles it was necessary to raise the middle part which created almost like an inverted staging: the audience were on the descending level from the centre outwards, and so anything that happened in the centre on the floor was quite difficult to see. There are always problems, challenges with places, but I love the grandness of it, the scale. I have created performances, circus, theatre, from factories to ports, harbours, supermarkets—everywhere. My desire to create work in non-conventional places, my desire to create work in what became a label, 'site-specific', comes not from a trend. I've been doing it for 25 years. And why? Because live performance—and I'm not calling it theatre or otherwise, I'm calling it live performance—is 150 years behind the visual arts. Live performance is still very much, in terms of how it is being read, is very much that proscenium arch left-to-right without ever challenging the thinking process of the viewer. So there will be a stand of people that say 'Oh Firenza stop creating these shows where you have to move around, I don't know quite what I'm supposed to be looking at. Can I not just sit down and have a good pre-packed show?' So there will be one strand of people that will say that and that will say 'You're very disrespectful of the audience, you never make them feel comfortable.' And then there'll be another strand of people that will say actually I respect the viewer as a creative human being and I would like not to stop them at a fourth wall and say from here to here it's mine and from here to here it's yours—but to say I would actually like to bring you into my world, into my image, to the risk of dirtying my image. Because I like as a director—of course I like to create an image and keep it clean, and wallow it and go wow isn't this image great, but I would like to bring you inside it, to breathe it, to smell it, to be part of that experience and to allow you to make your own narrative. Of course there is a narrative, of course there is a vision; there is research, there is a lot. But also, like true poetry, like true music, like true whatever, it has to have different correspondences. It has to be that even if I see a shape now, that maybe you reverberate and think about something else. And within its smudged at the edges quality, within this quite raw and raucous way of creating work, there are people that come to me at the end and say 'It's so emotional or powerful, there's something about it that I can't quite explain'. So it does obviously appeal to a less rational human being, and what I always say is it's not just you guys being the performers but its also the audience that has to fasten their seatbelts and enter the space. 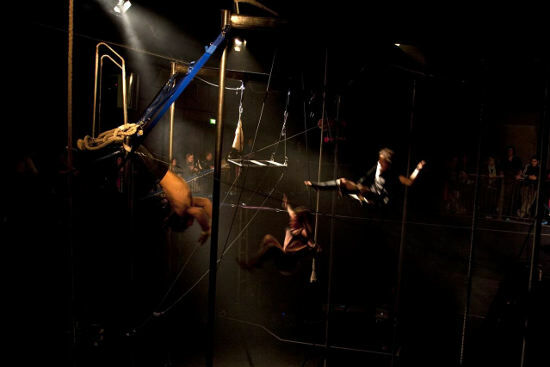 NoFit State have created this Directors Lab scheme where I will be now next week responding to the question, 'How do we create exciting circus in proscenium arch theatres?' So you know I could have said 'Look guys I'm not interested because I'm sick and bored and tired and...' But I said yes I will do it because I like every challenge. It's about engaging in a thinking process, engaging in OK, what would I do if I had a proscenium arch. What would I do if I had this challenge. And how do I transform a three-dimensional experience, bringing it into a flat two dimensions. When they offered me the opportunity to do it I said OK guys, if I have to respond to this challenge then give me a theatre. I can't be in a gym and speculate and say Oh well if it was in a proscenium arch I might be doing this. Let me work in a theatre with a group of people that I will choose. So it's research and development—this R&D which sounds like Rhythm and Blues and it's not. In fact we were trying to translate Research and Development in Finnish when we were there because the concept is quite non-existent. It's either a show or it's not a show. In the 70s there was this terminology which was 'work-in-progress' and that became a little bit like, well to me it just became like you can defy anything if you call it work-in-progress. Sometimes there was really no research behind it. So it became a bad word for me. There's really an enormous amount of research that's gone into Canto. I don't mean the railway and the memories, but actually there's a lot of work, a lot of tricks, which are not in the show because they're not off the lunge—it's really pushing flying into a more narrative level, without mats, without a lunge belt, very dangerous. Even just to do those two tiny scenes, which activate the whole stage, where they are flying without mats and they are letting go on a mat which is mobile—it took quite a lot of work and trust. There is a lot that hasn't gone into it yet—tricks and flying and ways of using two trapezes, meeting. So I think that as far as I'm concerned is how I want to work. I don't want to churn out and I embrace the circus aspect of it as a language that would allow me to go off the round and to be able to do things that I can't do with theatre, that I can't do with film. When I came first there was a lot of radical theatre in the 80s. There was Brith Gof, what was called at that point Cardiff Laboratory Theatre, there was The Magdalena Project, there was Moving Being, there was Paupers Carnival, there was Action PIE. It sort of all—with Margaret Thatcher, in the second half of the 80s and the beginning of the 90s, funding-wise as well—went down to that company, that company. So it became very dead in many ways. It's only now in the last five or six years that the funding bodies have recognised again that to rekindle from the ground you have to give smaller grants for people to be able to research. You have to have people that try, fail, but make a lot of work. Originally intending to be an actress, in her early twenties Firenza Guidi moved from her native Italy to Ireland. She spent six years there, while funding from Arts Council Northern Ireland allowed her to work with such important theatre practitioners as Jacques Lecoq, Philippe Gaulier and Dario Fo. With NoFit State Circus she worked on the many incarnations of Immortal as well as the latest large-scale tent show, tabú. Their Directors Lab scheme is an ongoing project to invite a series of directors from different backgrounds and disciplines to workshop new material with the NoFit artists—with the ultimate goal of presenting a new for-theatres piece in Milford Haven as part of National Theatre Wales' first year programme.